Built in 1930, this Art-Deco-style hotel is inspired by radio theme. 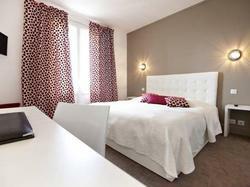 It is located on the heights of Chamalières and offers beautiful views of the town and the hills. All of the spacious room at the Hotel Radio feature elegant furniture, a TV and a private bathroom. Free Wi-Fi access is available in the entire building. A continental breakfast is served every morning and can be enjoyed in the guest rooms. The restaurant, La Radio, is well-known and offers gastronomic cuisine. Radio Hotel is just 2 km from the city centre of Clermont-Ferrand and 17 km from the Parc Naturel Régional des Volcans d'Auvergne. Free private parking is possible on site. This double room has a seating area, bathrobe and air conditioning. All of the spacious room feature elegant furniture, a TV and a private bathroom. Free Wi-Fi access is available in the entire building. The private bathroom has a bathtub. Bathrobes are provided. This double room comes with 1 double bed or 2 single beds.